And his clothes not be burned?" "If Senator Seliger believes serving as Chair of the Agriculture Committee — a critical committee for West Texas and all of rural Texas — is beneath him, he should let us know and the Lt. Governor will appoint someone else," said Sherry Sylvester, the Patrick advisor. This is bad; if it's not resolved quickly, it will consume the session. 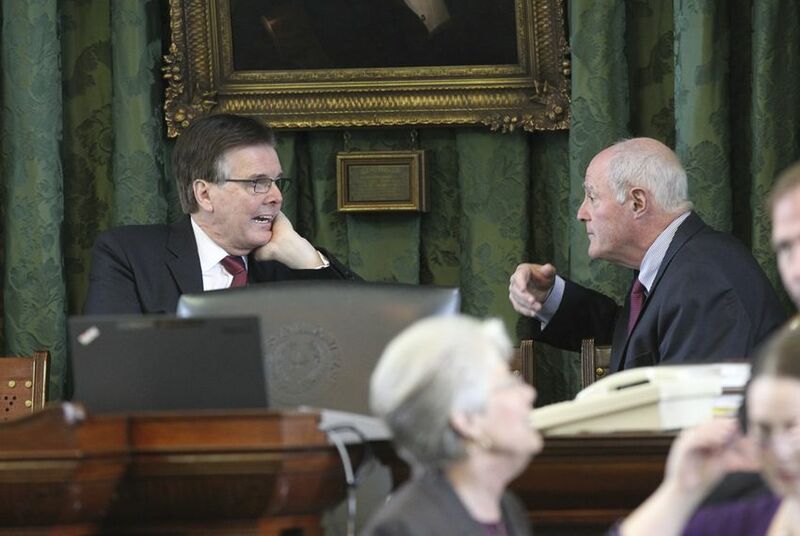 Understand something: Dan Patrick needs Kel Seliger's vote (during the regular session). It takes 19 votes to pass a bill in the Texas Senate (during the regular session). There are 19 Republicans. If Patrick loses Seliger, he has to find a Democrat. Depending on the issue, it might not be impossible to find some Democrats, but it's a lot easier to pass bills with Seliger on board. There's nothing wrong with removing Seliger from higher ed. While we had no complaints about his chairmanship last session (he passed the two bills we wanted passed), there's a fairly obvious case for replacing him. Furthermore, now that his wife is head of the Texas Exes, one could argue it's a conflict of interest. But tossing Seliger from Finance was STUPID. Finance is a gigantic committee. One member's vote doesn't change anything (esp. now that property taxes have been moved to a separate committee). Keeping the Finance appointment as a courtesy pick to a senior member Senator have been a no-brainer. Instead, Dan Patrick just gratuitously insulted that senior Senator at a time when the Senator in question has a lot of leverage. The worst part is that there was an obvious path to placate Seliger; it should have at least been tried. Kel Seliger is a legislator who, every session, has about a zillion priorities. Obviously, many conflict with conservative priorities. But a decent number of them don't. It doesn't take a genius to envisage a deal where Seliger gets all of his lower profile stuff in exchange for supporting Patrick's high profile stuff. As cooler heads prevail, here's hoping that still happens. But the cost for Seliger's cooperation just went up. And it will continue to rise as long as this conflict festers. Let's not overlook the potential nightmare of Seliger on Nominations. For all that, remember one other thing: Kel Seliger also needs Dan Patrick. Not as bad as the other way. But bad enough. For as much leverage as Seliger possesses during the regular session, it evaporates in a special. The Texas Senate operates under completely different rules during a special. This is something Seliger already knows, but it's something about which he should be reminded. If Kel Seliger is the only reason for a special session, he should get nothing. Bottom Line: Dan Patrick and Kel Seliger can both accomplish more by working together than by feuding. That's still true. Hopefully, cooler heads prevail.